I put mine in aligned with the others. I agree, the reason why you would stager it is unclear. 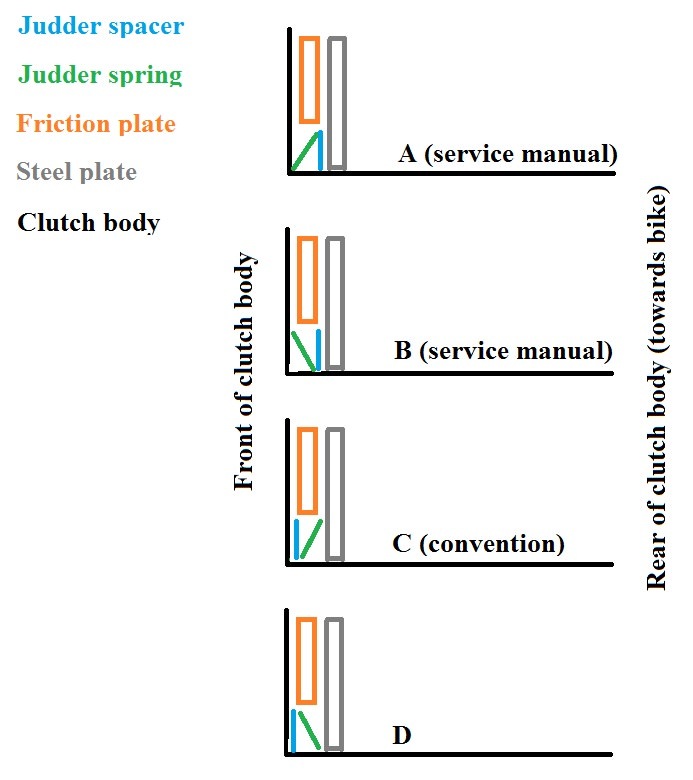 Also - I noticed (and you noted) in the service manual that the judder spring goes first, followed by the spacer. Which way did you put it? I noticed it's different than typical convention. Both the Hyper 821 and Monster 821 service manuals say to put the spring first, but don't specify which direction. I went with option A. Truthfully I bet it doesn't matter too much, but that's the service manual seemed to indicate. So, by "first" you mean counting from the outside. But when assembling this pack it is really "last." Just a bit confusing. Yeah... well, in this clutch it's a bit backwards. The spring does in fact go on first during assembly, and then it gets inserted into another ramped piece before going into the clutch basket. It's very plain to see and can only go together one way. For some reason I am unable to edit my original post. Important to note that Kuksul found an important error - the torque spec for the clutch hub nut is 140 ft lb, NOT 180-200. I would prefer to fix the DIY guide but the post is locked for some reason. Ordered just the conversion kit since I only have 6k on my clutch. Probably a dumb question, but I'm not seeing why we need 8 nuts for the threaded rod? I'm not sure either. I used 2 nuts. In hindsight some wingnuts would have been much easier. I used 2 nuts on each rod, locked together so they wouldn't spin. I said 8 because they cost pennies and are easy to lose.